Some pain while sleeping may come from your body positioning. If you can avoid twisting or bending your spine, you can avoid many causes of pain. Twisting can happen for a number of reasons. If you are a side sleeper and your hips are wider than your waist, you may end up with your lower spine sagging into the mattress on the side you are sleeping on. A helpful solution for this is to place a small pillow or roll under your side at about waist level, above your hips. (You may even try tying the pillow around your waist to hold it there throughout the night.) Be sure to use a pillow for your head as well. 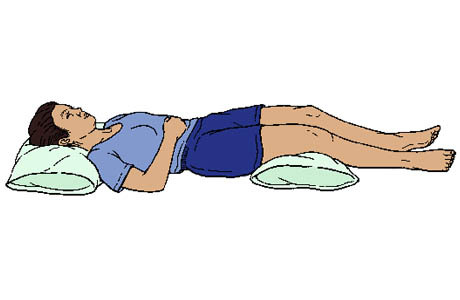 A pillow between your knees will keep your pelvis from shifting downward as you sleep. If you are a back sleeper, you can benefit by placing a pillow or roll under your knees to keep the lower back flat and to help it release tension. Also be sure to use a head pillow that supports your head without pulling it forward or allowing it to drop backward. Another type of pillow—the body pillow—may help. It can be used between the knees to keep the pelvis in alignment, and it can also be used to help keep the upper body straight. Without a pillow, the arm on top can cause the shoulder muscles to become over shortened and cramp and also pull the shoulder into a rounded position. A pillow used in front of the body to support the upper arm will help to hold the arm in place and keep the shoulder from rolling forward. A specific position may be difficult to maintain because, after all, you are asleep! But starting out in a good position may limit the time your body spends in a less-than-optimal position. Try these to see if they improve your quality of sleep. Let us know if these tips are helpful. We’d love to hear how you’re doing! Look for our next tip which will give more ideas for sleeping without pain. To see Tip #1: Stomach Sleeping, click here.